So far CML Staff has created 1 blog entries. Give a gift to Cedar Mill Community Libraries! 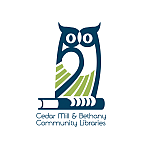 We are a nonprofit dedicated to providing library services within the Cedar Mill and Bethany neighborhoods. Give a gift today to support our diverse community of readers and learners!